In the past few days, the Eighth Camellia Cultural Exhibition was officially launched in the Golden Camellia Park. 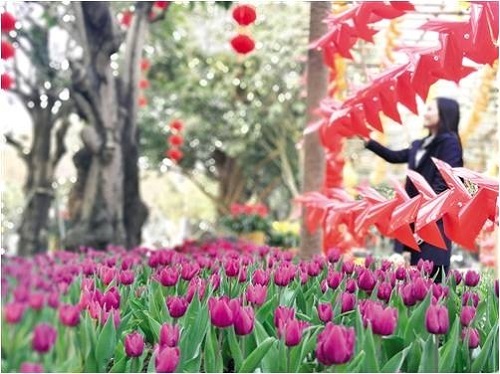 It is understood that the theme of camellia cultural exhibition this year is “Camellias Blooming in Nanning · Flourishing Age with Luxuriant Flowers”, and it also designs the garden scenic spots which shows the characteristics of Chinese traditional culture, Guangxi ethnic culture, etc. There are three parts in the camellia exhibition, which are camellia scenic spots exhibition area, elaborate camellia exhibition area and camellia cultural exhibition area respectively. The number of types of camellias displayed can be up to more than 500 while that of camellia plants displayed is more than 10,000 and the number of herbaceous flowers excesses 20,000 pots. The exhibition time span extends from Jan. 28th to Feb. 28th.